House V 1,13 has been identified as a thermopolium, popina, taberna and a caupona. These various denominations are due to the counter with built-in vessels in room a. 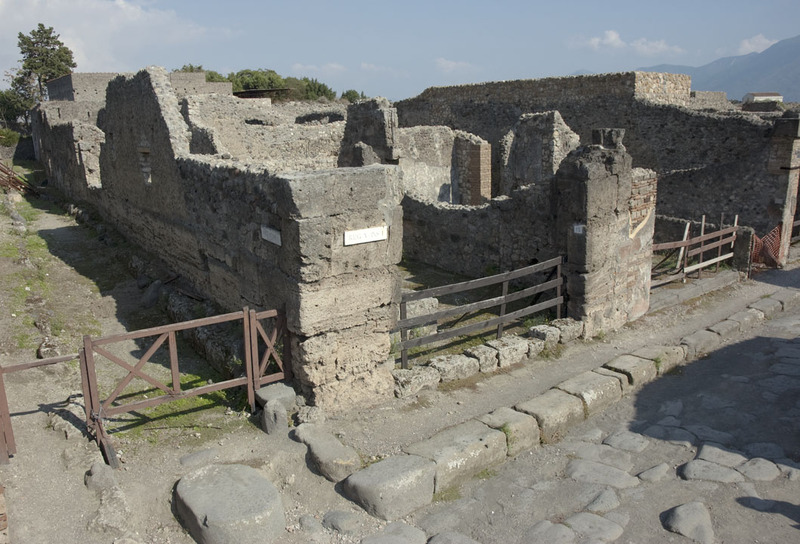 Open to the street, this room is where customers were served in the last days of Pompeii. The north faÃ§ade is one of the oldest in the area, relatively dated by the opus quadratum technique, to the 2nd, or late 3rd, century. The parcel allotted to the caupona, V 1,13, located between the bakery (V 1,14-16) and Vicolo delle Nozze dâ€™Argento, has an oblong, narrow shape. Early Bronze Age remains were discovered during the investigation of a well in the rear part (room f) of this house. Behind room a are rooms b and c; the latter is a corridor which leads to rooms e, d, and the rear room f, functioning as a kitchen in AD 79. A staircase in room d leads to the second floor. Our investigation of rooms a and b indicates that corridor c is a late rearrangement of the interior space of this house. In an earlier state the house consisted of a suite of rooms, with a north-south extension covering the full space between its boundary walls. The house was cleared in 2004-2006. The same type of plaster has been found on three outer walls of V 1,13: on the northern faÃ§ade, on the eastern face of the ashlar, where the northern faÃ§ade of V 1,18 abuts the opus quadratumz wall, and behind the interior walls of V 1,14-16 abutting the outer south wall of V 1,13. These plaster remains indicate that the facade of V 1,13 was decorated with the same plaster on at least three sides, before the interior arrangement of V 1,14-16 was constructed. It is also important to notice that V 1,13 is built on a higher ground level than V 1,14-16. 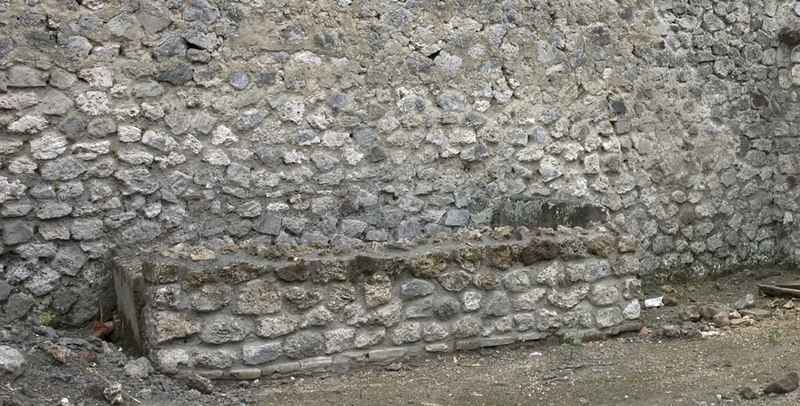 The opus quadratum wall, the location on a higher ground level, together with the plaster on three outer walls of V 1,13, leads to the conclusion that V 1,13 is the earliest building in the NW area of the insula, presumably to be dated to the late 3rd or early 2nd century BC. The two large doors must have been an original feature of the opus quadratum construction of V 1,13. 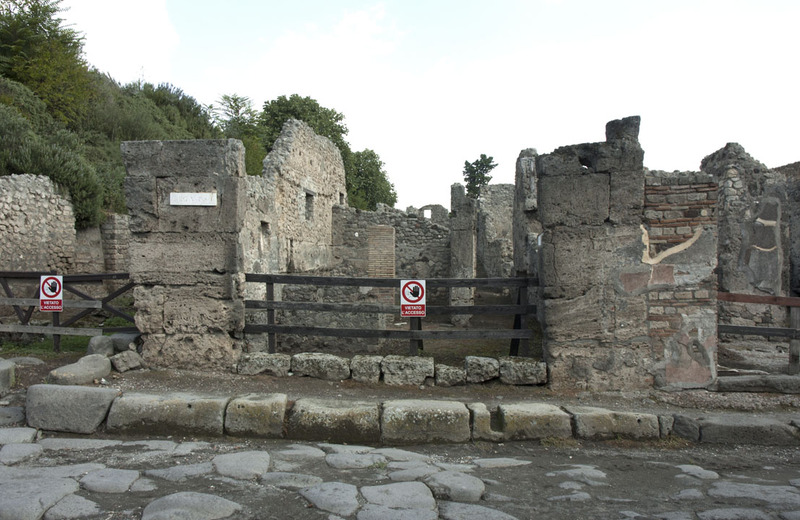 Though today oriented towards Via del Vesuvio, we can assume that the western door was originally oriented towards the path along the Vicolo as well, though not opening directly to the street. 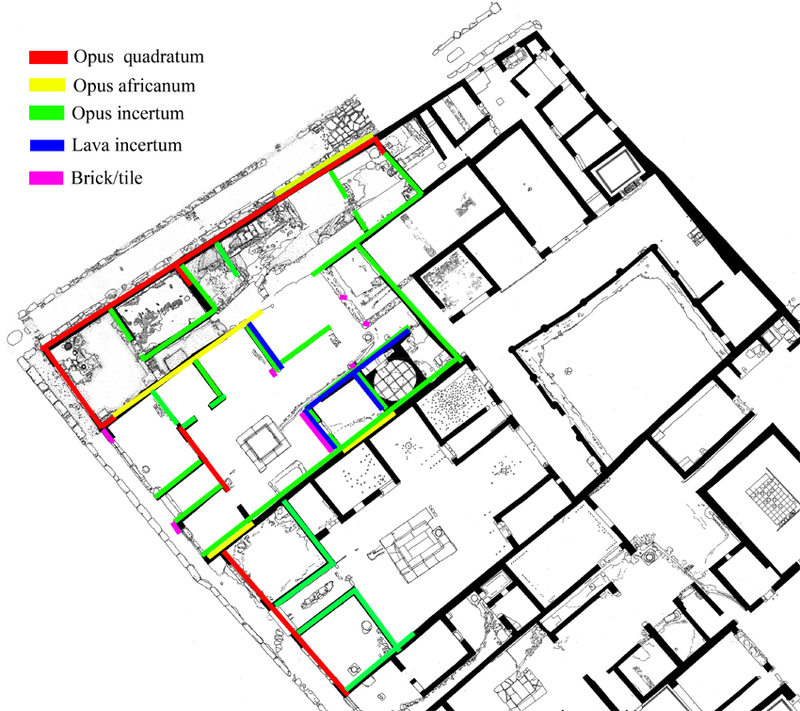 The only indication of the internal arrangement of V 1,13 in its early phase is the header from the opus quadratum wall, acting as dividing wall between rooms b and e.
Concerning the design of the NW corner of Insula V 1, we can conclude that the outer walls of V 1,13 are the oldest walls in the area investigated. This building was originally oriented towards Vicolo delle Nozze dâ€™Argento, by the door in the northern faÃ§ade, later closed, as well as the large door facing west. We can assume that the area of V 1,14-16 was in its early stages more or less open and presumably used for farming. It is also likely that the property of V 1,13 extended further south, incorporating parts of the area of what later became V 1,14-16. The NW corner must have had a different appearance in its early phases: a freestanding building with a massive faÃ§ade, located on the highest ground level in the area, and with an open field to the south. The later V 1,14-16 was built with a simple layout, later to be rebuilt and redecorated in several stages, presumably at the same time as Via del Vesuvio grew in importance. 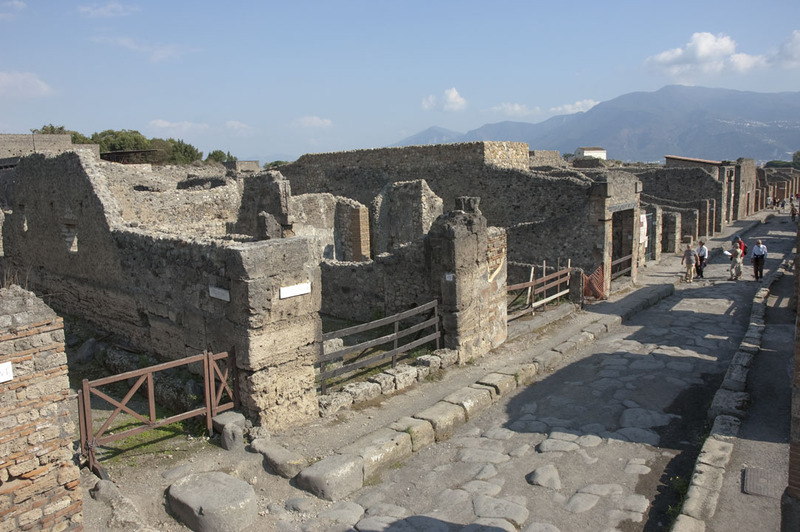 The space between the freestanding buildings was occupied with new structures, and the townscape of Pompeii, 79 AD, slowly emerged. Minor investigations below the level of AD 79 were conducted in rooms a (2006), c (2006), f (2004, 2006) where floors were missing. The upper part of the well-shaft in room f was emptied of lapilli. During this work (2004), Early Bronze Age layers were discovered. Excavated September 9-10, 1875. The dates are mentioned as the date of major findings (9 Sept) and when the building was emptied (10 Sept). Giornale degli scavi di Pompei, n. s., ed. G. Fiorelli, vol. 3, 1874-1877, 251-255. Giornale degli scavi di Pompei, n. s., ed. G. Fiorelli, vol. 4, 1878-1879, 77-78. A. Mau, â€™Excavation reportâ€™, BdI 1877, 135-138. 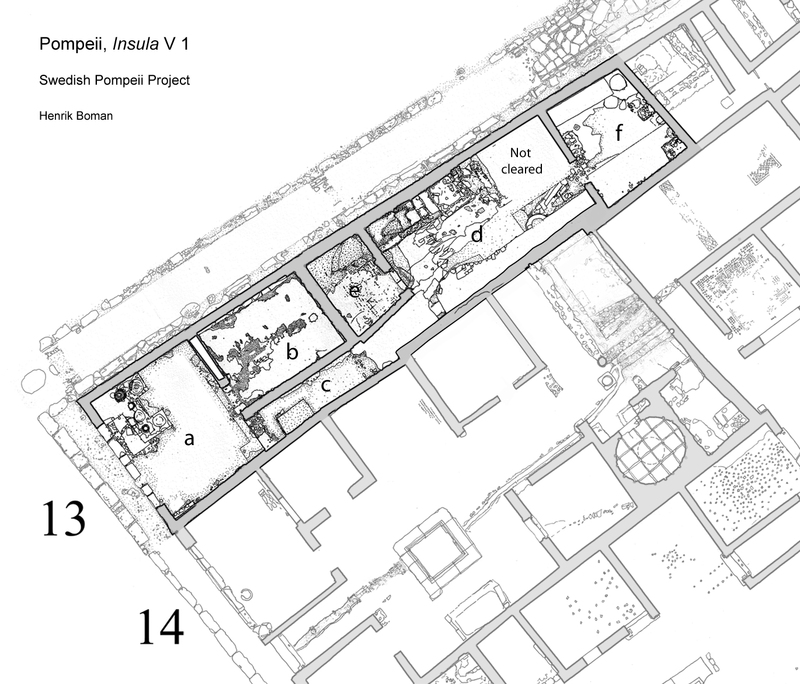 M. Nilsson & M. Robinson, â€™Remains of prehistoric habitation beneath Pompeii V 1,13â€™, OpRom 30, 2005, 97-103. H. Boman & M. Nilsson, â€™The early street and the prehistoric finds in Vicolo delle Nozze dâ€™Argento, Ancient Pompeiiâ€™ OpRom 31, 2006. M. Nilsson, â€™Evidence of Palma Campania settlement at Pompeiiâ€™, Nuove ricerche archeologiche nellâ€™area vesuviana (scavi 2003-2006), Atti del convegno internazionale, Roma 2008. H. Boman & M. Nilsson, â€™The commercial establishments V 1,13; V 1,14-16; V 1,20-21: Preliminary report 2001-2004â€™, OpRom 31-32, 2006-2007. J. Overbeck, Pompeji in seinen GebÃ¤ude, AlterthÃ¼mern und Kunstwerken, Leipzig 1884. T. Kleberg, Hï¿½tels, restaurants et cabarets dans lâ€™antiquitÃ© romaine: Ã©tudes historiques et philologiques (Bibliotheca Ekmaniana Universitatis regiae Upsaliensis, 61), Uppsala 1957. T. Kleberg, â€™RÃ¶mische WirtshÃ¤user und Weinstubenâ€™, Altertum 5, 1969, 146-161. J. Packer, â€™Inns at Pompeiâ€™, CronPomp 4, 1978, 5-53. V. Gassner, Die Kaufladen in Pompeji, Wien 1986. H. Eschebach & L. Eschebach, GebÃ¤uderverzeichnis und Stadtplan der antiken Stadt Pompeji, KÃ¶ln 1993. H. Boman, â€™White light ï¿½ white heat. The use of fire as light and heat source in an atrium house in Roman Pompeiiâ€™, Current Swedish Archaeology 13, 2005, 59-75. H. Boman, â€™The interaction between street and houses in the NW corner of Insula V 1â€™, In Nuove ricerche archeologiche nellâ€™farea vesuviana (scavi 2003-2006) Atti del convegno internazionale, Roma 1-3 febbraio 2007, eds. P.G. Guzzo & M.P. Guidobaldi, Naples 2008. View along the facade of Via del Vesuvio.